We just got back from the weekly demonstration at Kufr Qaddum, a small town in the North West Bank that since 1975 has suffered from the nearby (illegal) Israeli settlement of Qadumim, and the expansionist, colonialist projects that have trailed in its wake. 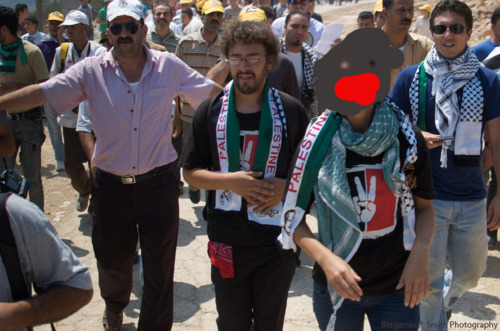 The Popular Committee at Kufr Qaddum has held weekly demonstrations in the town since early July to protest, among other things, the nine-year partial closure of the town’s main road, the uprooting of 3,000 olive trees, the building of an Israeli military base in Kufr Qaddum, and the establishment, around the settlement, of several colonial neighborhoods which further steal Kufr Qaddum’s land. In 2003, a crucial section of the main road that links Kufr Qaddum to the nearby large town of Nablus (from where I write this article) was illegally obstructed by Qadumim settlers, and later officially closed by the Israeli military, turning a 15 minute commute into a 1 1/2 half detour. This significantly increases travel expenses, makes study difficult for those en route to Nablus university, and endangers the lives of those trying to reach the Nablus hospital (two Palestinians have died in recent years for this reason). 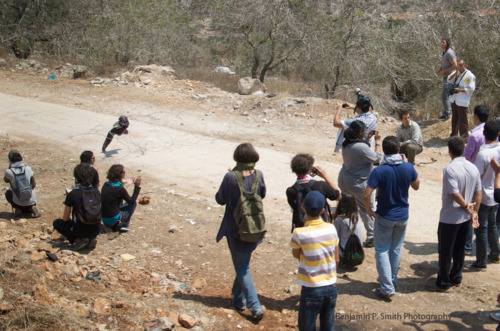 After years of legal protest in the Israeli High Court, Kufr Qaddum received a (rare) legal ruling in their favor, but the Israeli military delayed re-opening of the road until 2012, citing (absurd) safety reasons. Thus, the protests began in July. We hatched a plan last night to use wire cutters to cut the waist-high razor wire fence that stretched across the main road, in plain view of demonstrators and soldiers. The purpose of this act, we reasoned, was public action- whereas the protest last week just petered out and fizzled away, with the townspeople returning to their homes in a half-satisfied Ramadan daze, we felt that this week people needed something to cheer about, a sign behind which to rally. 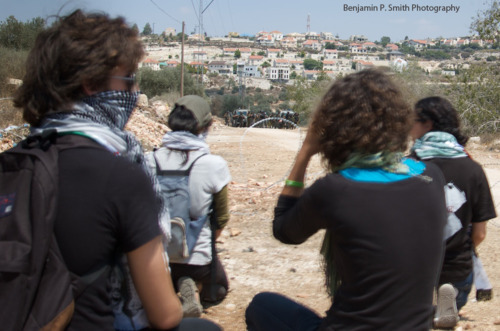 We assigned roles- folks to cut the fence, folks to pull the fence back, folks to videotape, and folks to watch the actions of the soldiers, who were standing beyond the barbed wire fence, on the closed-off road, between Kufr Qaddum and Qadumim. It was important for internationals to carry out this action, at the front of the demo and in full view of the soldiers, because when internationals are present, soldiers hesitate to fire rubber bullets, and instead settle for the less dangerous tear gas. 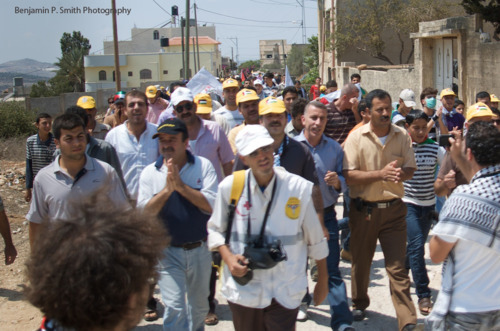 The crowd, of about 100 Palestinians and 15 international activists, chanting and clapping, walked up the road towards the razor wire fence, and we saw the 20 or so soldiers standing ominously, 50 meters beyond the fence. Then, after about 20 seconds, came the tear gas. Instantly I was running- I have never experienced tear gas like that before. It is like you are an ant, flailing to death in the middle of a fizzling can of Sprite; instantly, tears fill and overfill your eyes, and your throat is scorched with a pepper-like ferocity. You cannot breathe, a thousand burning pebbles prick every inch of your skin, red tingly heat claws at you from all sides, a flaming fist of cayenne pepper and chili powder punches you in the gut. Your face instantly collapses into a puddle of tears and runny snot. 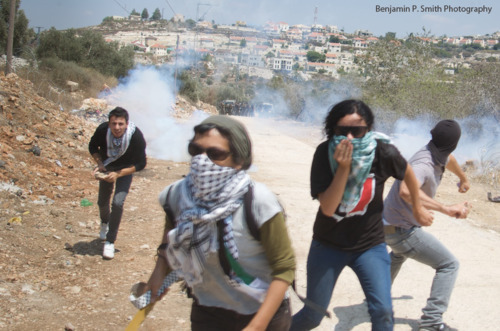 Thankfully, some Palestinians rushed up to me and sprayed perfume at my nose, to remind my body that it could breathe. Then the shebab (young guys) began throwing stones at the soldiers, in the thick of the clouds of tear gas, which of course, after a lull period of two minutes, prompted another volley of tear gas, which stimulated another mass run further down the road, which in turn inspired another round of stone throwing, which called forward another volley of tear gas in response….one part of my brain wanted to question ‘why do the shebab keep provoking them?’, and that part of my brain wanted to yell at them ‘stop throwing stones! i dont want to be teargassed anymore!’ but the whole point of our mission here is to support the palestinian effort; and while objectively it is obviously futile, and merely provocative, to throw stones, on the ground it is a supreme expression of will, triumph and resistance. extremely moving it is to see a palestinian teenager, completely swamped by tear gas and without even a kafiya to protect his face, throwing a stone at an advancing israeli soldier in gas mask and full combat gear. and after the demo was over, the cheering and hollering that gripped us in spasms of applause was completely electrifying! the feeling of collective accomplishment put a bright smile on everyone’s faces; we all stood in front of two soldiers positioned on top of the hill, jumping and waving, screaming in joy, flashing peace signs in their faces.